My niece asked my brother today, "Why does uncle eat so much ramen?" Then we all just busted out laughing. Haha! It was hilarious, but I guess you had to be there. Hopefully, today's slideshow will make you feel like you were. I met my brother for lunch in Akasaka today because he swears that he works near the best Tan Tan Ramen shop in Tokyo. And you know what? He may be right! Intense, spicy, hot, sinus-clearing. Those are just a few ways to describe it. Chinese Restaurant Takekuma is a hidden gem waiting to be exposed! They also have a good Hot & Sour Ramen and an impressive Vegetable Tan Men. Today was mostly about hangin' out with my nieces. They are so damn cute! Future ramen geeks better watch out! Got another day in Tokyo tomorrow until it's off to Kyushu. Can't wait! That bowl looks like it could feel good going in, but bad going out. Keep up posted. Looks great Keizo! I had a kurogoma tan tan men before that was pretty good, forgot where though. 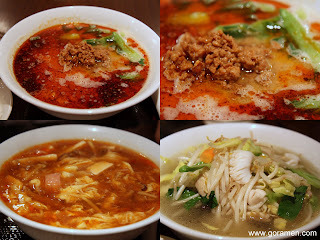 It seems hard to find these soup varieties of tan tan men here in the states that are so popular there. @Brian: Haha, you don't wanna know! @Dennis: Yeah, it's too bad there aren't more of these places in the states. @paul: Uuuh...thanks for sharing. Would you like me to go take pictures of the hotel for you? Haha. Dude your nieces are so awesome. :) You're teaching them the differences in Soup and Noodles already, right? LOL. @EK: I don't have to teach them. They were born with the knowledge. lol. TTM was a lot better than CMY.